Sports Shooter Academy instructor Wally Skalij with workshop participants. Skalij is a staff photographer with the Los Angeles Times. 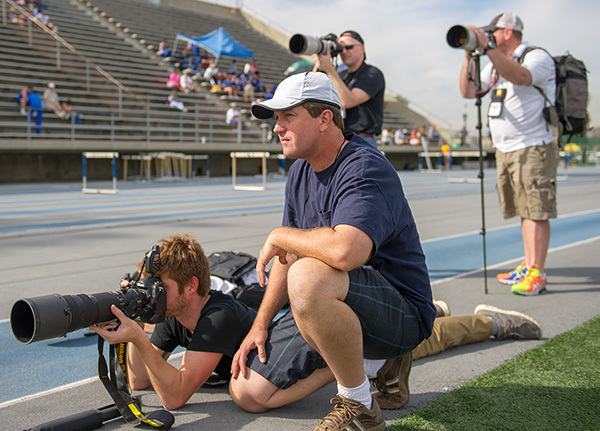 Covering real sports events in Southern California under the guidance of a faculty of award-winning photographers is the hallmark of the Sports Shooter Academy workshops. Sports Shooter Academy 12 will be held November 4-8 with three full days of shooting. Sports events include: College football, soccer, basketball, volleyball, water polo and rugby. Also there are opportunities to shoot surfing and a local boxing gym. Each evening participants will edit their work and receive one-on-one critiques from the instructors. "At the end of the day the work you make is only part of the picture. It is incredible to meet so many photographers who are passionate about photography and telling stories that involve sports," said freelance photographer Josh Barber who attended Sports Shooter Academy XI last fall. "Faculty and attendees alike there is something to be learned from everyone, and that doesn't stop on the final day of the workshop. You leave with many more talented photographers as friends than you came with."